In this Dec. 4, 2017 file photo, the future USS Michael Monsoor leaves Bath Iron Works for sea trials. 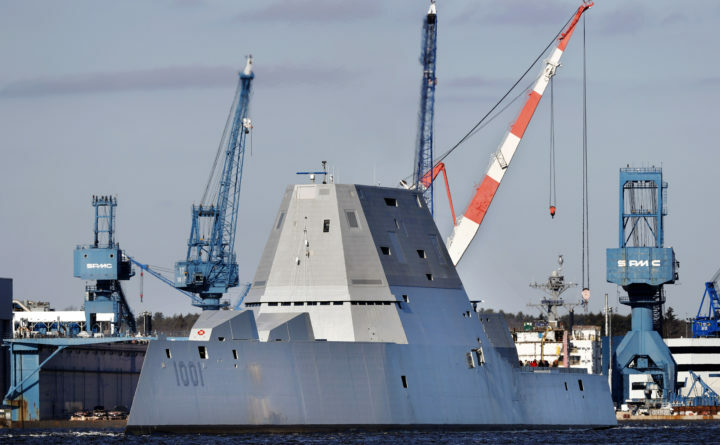 BATH, Maine — Navy shipbuilder Bath Iron Works has celebrated construction of a new destroyer, and has sent another one on its way to join the Navy. U.S. Sen. Susan Collins was on hand Friday to mark the start of construction of the future USS Patrick Gallagher. The Arleigh Burke-class destroyer is named for an Irish-born Marine who was awarded the Navy Cross for his actions in Vietnam. Collins, who is credited for helping to secure funding, spoke to shipbuilders at the Hardings facility where large pieces of metal are fabricated in Brunswick. With help, she operated a massive machine to cut the first piece of metal for the ship. Also Friday, the future USS Michael Monsoor departed the shipyard. The ship is the second of three Zumwalt-class so-called stealth destroyers built in Bath.